I first became aware of Jack Mitchell’s extraordinary photographs in 1970 when I was in high school in Pittsburgh, Pennsylvania. I had purchased a copy of ‘After Dark’ magazine because it had photographs Jack had taken of Andy Warhol superstar Joe Dallesandro. Joe was then starring in Paul Morrissey’s “Trash” with Holly Woodlawn. I wanted to go to NYU film school in New York City and meet Warhol and the superstars, which is exactly what happened. Little did I know that more than 30 years later I would beome close friends with Jack Mitchell, create his website, work with him for more than ten years on licensing and various projects, and make a feature-length documentary about his life and career. “Jack is a rather extraordinary historian. I guess you could call him a photographer, but he transcends that," says Pulitzer Prize winning playwright Edward Albee in my 2006 documentary “Jack Mitchell: My Life is Black and White”. “Virtually everyone who is someone in the arts has found a path to Jack Mitchell's photography studio on East 74th Street near First Avenue in New York," Annette Grant writes in her New York Times tribute to Jack upon his retirement in 1995. Jack’s extraordinary talent made that happen, and he captured an amazing history of the arts on hundreds of thousands of frames of film in his lifetime. Jack Mitchell was born in Key West in 1925 and grew up in New Smyrna Beach, Florida. When he was just 14 years old his parents recognized his talent as a photographer and built him a darkroom. They also bought him an expensive camera which he took to a War Bond rally in 1942 in Daytona Beach to photograph Hollywood star Veronica Lake. Not knowing or caring that Lake’s trademark look was to wear her hair obscuring one eye, young Jack asked her to pull her hair back. She laughingly complied and Mitchell sold the photograph to the Daytona Beach Observer newspaper. At age 16 he became the youngest person the newspaper had ever issued an official Press Card. Jack spent his military service stationed in Italy at the end of World War II as a U.S. Army public relations photographer. In 1950, several years after returning to the U.S., he moved to New York City. At the suggestion of modern dance pioneer Ted Shawn, he first concentrated on photographing dance and dancers. William Como, editor of Dance Magazine (and later editor and publisher of After Dark magazine) began assigning Jack to shoot photographs. He would go on to shoot 168 cover photographs for that publication alone. In 1957 Jack met Bob Pavlik. Within a few weeks they moved together into a large apartment at East 74th Street and York Avenue with adequate space for a studio, a darkroom, and living. Bob became Jack’s business and life partner. In the 1960's The New York Times Arts and Leisure section editor Seymour Peck and photo editor Lonnie Schlein became aware of Jack Mitchell’s work and began assigning him to photograph major artists and performers. Mitchell’s photographs appeared on the covers of and in The New York Times Magazine, Rolling Stone, People Magazine, Newsweek, Time, Life, After Dark, Vogue, Elle, Harpers Bazaar, Vanity Fair, Madam Figaro, Stern, and virtually every domestic and international publication featuring photographs of arts personalities. 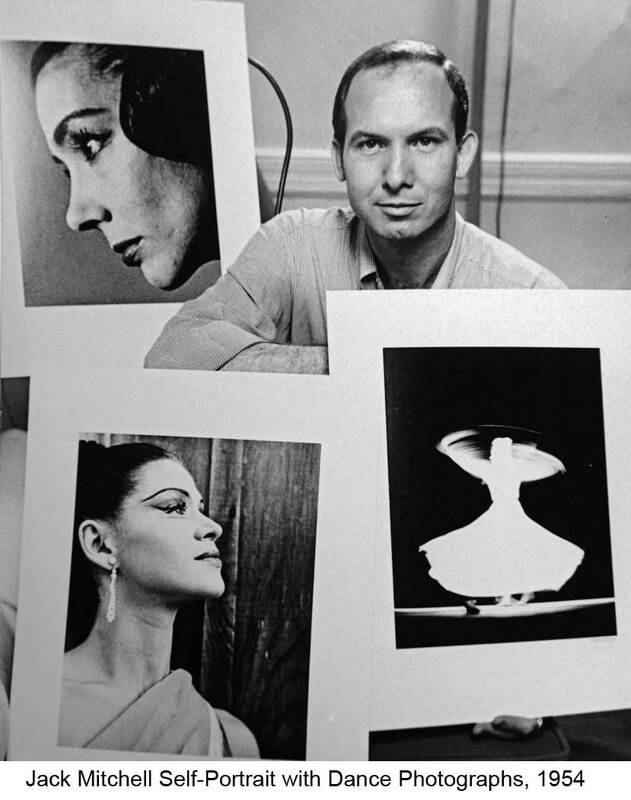 Jack’s career in New York City was a delightful whirl of photo assignments and cultural and social events with personal friends including Broadway diva Patti LuPone, composer Ned Rorem, dancers Judith Jameson, Kevin McKenzie, and Merce Cunningham, critic Clive Barnes, playwright Edward Albee and Hollywood star Gloria Swanson. He photographed Gloria Swanson in her bathtub and at her Cardiologist’s undergoing an EKG. He photographed the American Ballet Theatre in his studio and at the White House giving a command performance for the Kennedys. Jack’s professional and personal connections led to some funny juxtapositions. Jack had photographed transvestite superstar Candy Darling in his studio in 1971 after she starred in Andy Warhol’s “Women in Revolt”. Candy admired a recent photograph Jack had taken of Veronica Lake and learned from Jack that Lake lived with a tugboat captain in lower Manhattan. Candy subsequently discussed this with Andy Warhol. 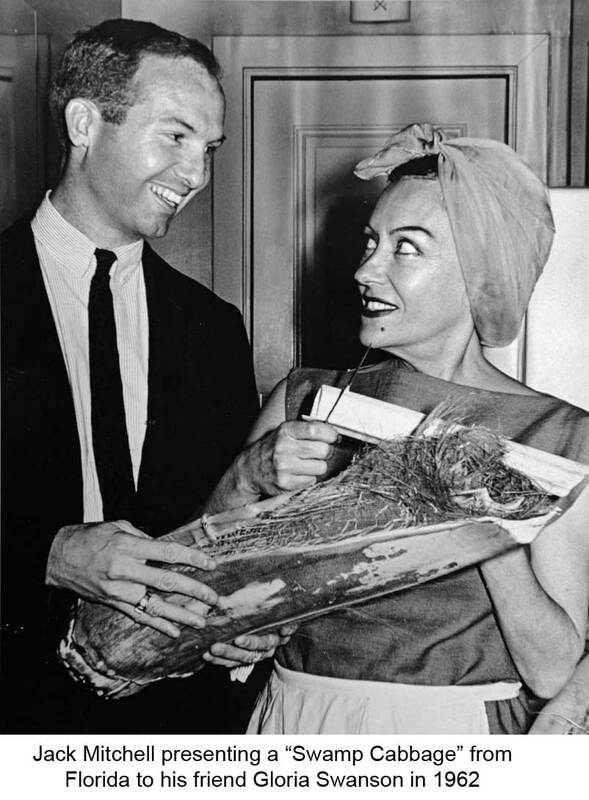 Days later Jack and Bob found themselves hosting a cocktail party for Warhol and director Paul Morrissey so that they could size up Veronica Lake to see if she might be right for the lead in their next film, “Heat”. Veronica (whose real name was Connie Ockelman) was a heavy drinker and partier. She impressed Paul Morrissey but he wound up casting Sylvia Miles opposite Joe Dallesandro in his send up of “Sunset Boulevard”. As a teenager Jack had experimented with dramatic lighting and aperture and depth of field and shutter speed – all the technical tricks to achieve a certain look. From his study of dance he learned to direct his subjects, to choreograph for the camera. For many photo sessions he planned in advance and sketched out his ideas. But Jack also had the ability to respond instantly to his subject and knew intuitively how to get them to drop their defenses and shed their public image of themselves, capturing them in a new fresh light. Jack was one of the last photographers to photograph John Lennon and Yoko Ono just days before Lennon was murdered. Photographs from that session demonstrate how talented he was at putting his subjects at ease and capturing their candid selves. John and Yoko both wore sunglasses initially but Jack got them to remove them and to relax. The resulting images show John as alternately playful and soulful, and reveal Yoko as both protective and loving. In 1995 Jack officially retired. The New York Times paid tribute with a full-page illustrated article about his forty-five year as a major photographer in New York City. His archives from that career include negatives, transparencies and vintage prints from more than five thousand photo sessions with major creative and performing artists of all disciplines. 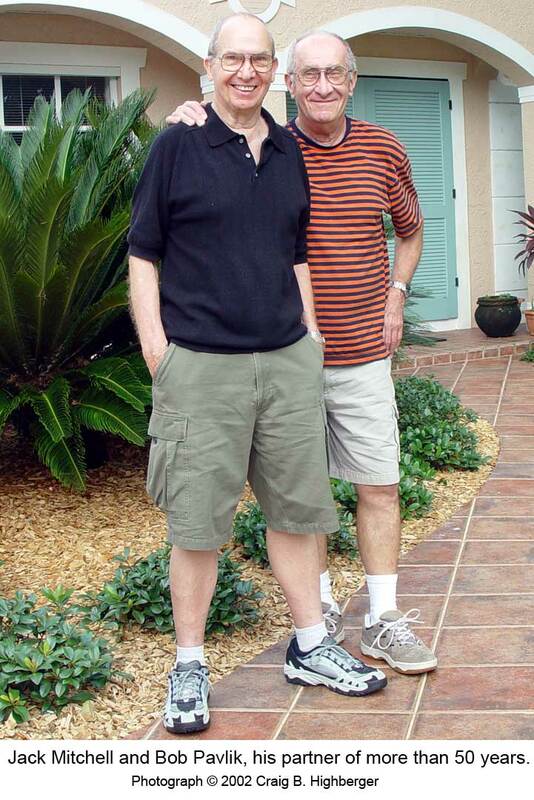 Jack and Bob moved the contents of their apartment and Jack’s studio back to Jack’s boyhood hometown, New Smyrna Beach, Florida. They found a beautiful three-bedroom home with swimming pool just blocks away from the site of the school he had attended as a boy. Jack converted a freestanding storage shed into a darkroom. There, for the next fourteen years Jack happily spent his days making beautiful exhibition prints of hundreds of his photographs. In 2009 disaster struck. One day Jack was putting away a hose after adding water to the swimming pool. He slipped on the wet pool deck and fell backwards against a wooden chaise lounge, cracking several vertebrae in his spinal column. After surgery, Jack was never again able to stand up straight and he experienced constant back pain. Worst of all, months later while he was still recovering, Bob went into surgery for an abdominal infection. Bob Pavlik, Jack’s life partner for more than 50 years, died before awakening from the anesthesia. Unable to work in the darkroom because of his back problem and reticent to travel or be seen publically because of his inability to stand or walk normally Jack became more or less a recluse. Fortunately he had a circle of close friends nearby who rallied around him, keeping him from complete despair. 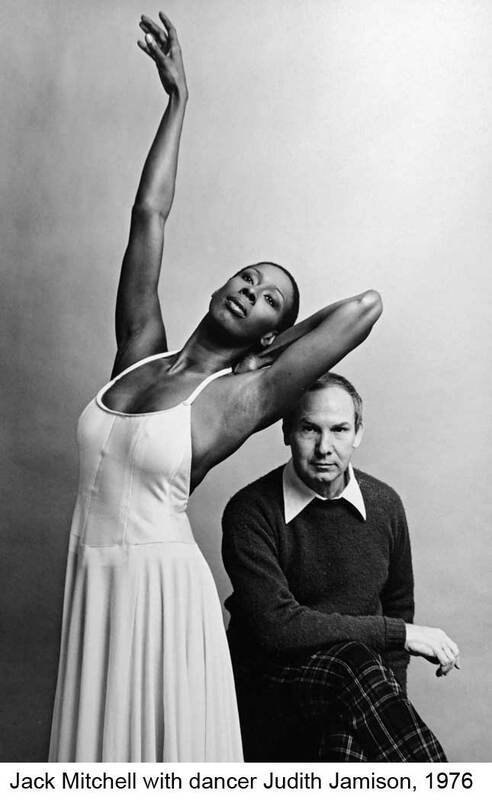 Before his accident, Jack and I had begun work on two books, one a collection of his photographs of men, the other a chronological retrospective ﻿(1950-2000) ﻿of his dance photographs. I also began the work of scanning, restoring and printing Jack’s beautiful color transparencies, bringing the prints to him in large batches for his approval and signature. These projects kept Jack busy for the last several years of his life. He spent many happy hours going through his boxes of exhibition prints selecting the images for the books and checking his files to compose the captions. I had not seen Jack for about five months when I arrived days before his 88th birthday in September 2013. I was shocked at his condition. In just a few months he had lost a lot of weight. He could barely climb the stairs to his office and bedroom. I was there to go over final work on his dance book and for his 88th birthday party with 12 of his closest friends. We almost had to cancel the party because of his ill health. But after several days of bed rest Jack rallied for the gathering and he smiled and chatted and laughed all night, although he had no appetite at all. Just a few weeks later he needed around the clock hospice care. Jack Mitchell died peacefully in his home on November 7, 2013 surrounded by his closest friends and the life’s work that he loved.